This quiet and lovely house located at Bonaire, a very quiet area, is perfect for 6 people and just 400 meters distance from the sea!! Welcome to this beautiful house, where you will feel so peaceful sitting at the porche surrounded by little trees. It also disposes of a fantastic equipped terrace with a barbecue and hammocks. The property has some direct neighbours, and you will be only 400 meters distance from the beach.As soon as you walk into the house, you will find a fantastic dining-room with a satellite TV, air conditioning and a wood heater. There is also a refurnished kitchen with vitro hub. The house disposes of three bedrooms with wardrobes, one of them with a double bed and the rest with two single beds each. There are two bathrooms, one with a bath and another one with a shower. You can enjoy the air conditioning at the dining- room and the hallway and if you come over in the winter, we will provide you up to three heaters. If you travel with your baby, we will provide you a cot and a high chair under request. 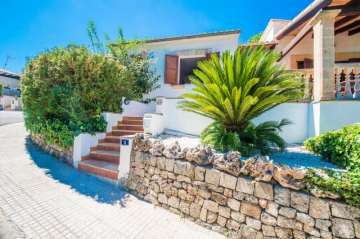 You will find a washing machine, an iron and an iron board in the garage.Bonaire is a very quiet place, located in Alcúdia. The property is near the port, full of boats and very lively, and we highly recommend a visit to the sand beaches like Sant Joan, or if you preffer rocks, then go to La Victoria.Puerto de Alcúdia is ideal to practice watersports, do some shopping or taste the typical food at good restaurants. Dont miss Cap de Formentor, one of the most lovely places at the island with a fantastic scenary, and the Alcúdia traditional market, wich takes placeon Thursdays and Sundays.For aditional fees please contact the advertiser.Pets are not welcome.Events celebration is not allowed.There is a parking for 2 cars.Distances:Beach: 0.40 km - Bonaire, Mal PasAirport: 62.3 km - Son Sant JoanGolf Course: 7 km - Golf AlcanadaVillage: 4.5 km - AlcúdiaTrain Station: 17.2 km - Sa PoblaBus Stop: 4.0 km - AlcúdiaFerry: 4.8 km - Port d"AlcúdiaHospital: 10 km - Playas de MuroTourist license: 1293 ETVThere's a mandatory tourist tax in Balearic Islands, called Ecotasa. All guests, except people under 16 years, have to pay this tax. The amount varies between 0.55€/night and guest during the low season and 2.2€/night and guest during the high season and is reduced by half from the 9th day for your stay. Guests will receive an email 7 days prior to arrival with mandatory general deposit payment information. The deposit is payable by credit card via a secure link within 24 hours after receiving the email. For more details, please contact the office using the information on the reservation confirmation received after booking. Mallorca is the largest island of the Balearic Islands, here you think of beach resorts, but there are more ways to enjoy the coast and inland, especially in autumn and winter, when the large groups of tourists are gone and the temperature is therefore more suitable for outdoor activities. You can spend a week in the Tramuntana mountain range in the west of Mallorca, walking or cycling. Or you visit a winery in the center of the island where you can try local traditional wines. Visit a farm by bike or walking, here you can learn how to make sobrasada or mallorquin pork sausages. You will find great places to eat here. The chefs of Mallorca use traditional recipes adapted to modern tastes. There are six Michelin star restaurants on the island. This famous enthusiasm for the local cuisine can also be seen in the other restaurants on Mallorca. Even though you have been to the island several times, there is always something to discover, especially if you enter the lush inland or explore the spectacular coastline. Normally the beach season starts in May until the end of October, but the island is also beautiful in spring when the walnut tree is in bloom. Outside the hottest months of July and August, the Balearic Islands are an ideal place for an active holiday, where you can see everything if you are interested in plants and birds, or if you want to discover the local culture. While many beach resorts close during the winter months, Mallorca is an ideal holiday destination all year round. If you want to do more than lie on the beach, take advantage of the low winter prices and enjoy the taste of real life on the Balearic Islands.